Neighborhood advocates say Mayor Ed Murray agreed to “pause” the opening of a long-planned 24-hour shelter for the homeless. After months of delay, Seattle city officials say they are speeding toward the opening of a long-planned 24-hour emergency shelter for the homeless. Outfitting of the facility is 70 percent complete and it’s scheduled to open this summer, Seattle officials said. But according to neighborhood advocacy group Friends of Little Saigon, Mayor Ed Murray has agreed to “pause” the opening of the shelter until residents approve a plan for operating the facility. “The ‘pause’ means that although construction to upgrade the center is going on, the service provider will not occupy the building and start their programming until the plan is approved by the community,” the group said in a statement. The group has pushed back against the city’s decision to locate the facility in Seattle’s Chinatown International District since it was announced in February. When asked if Murray had agreed to delay opening the shelter earlier this month, Meg Olberding, Human Services director of external affairs, said only that the city had not set a date for the shelter’s opening. Asked for clarification, Olberding would not say if the opening of the shelter hinges on the community’s approval. City officials are “working for a summer opening, and between now and then we hope we can work through their concerns,” she said. The dust-up is the latest development in the controversy over the siting of the shelter. Officials had hoped to open it by the end of 2016, but a fruitless search for a site pushed the city’s timeline. 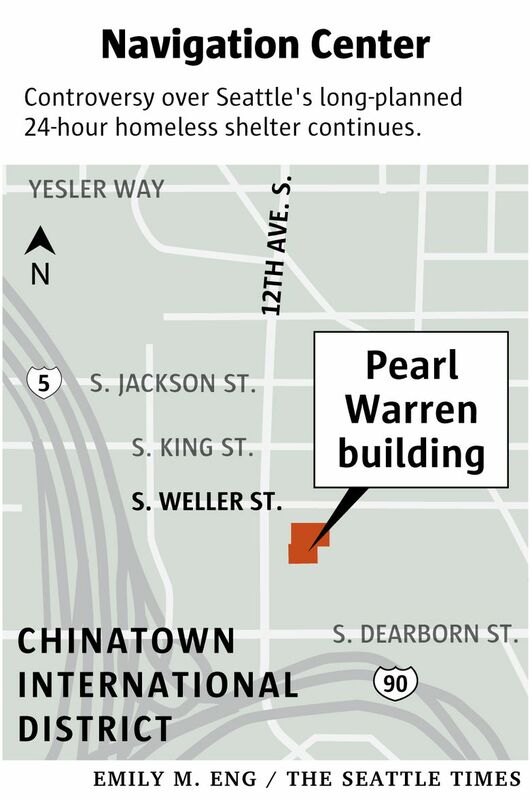 In February, the city reached an agreement with the Seattle Indian Services Commission to rent the bulk of its Pearl Warren building, on the edge of the International District on 12th Avenue. In addition to paying $60,000 in annual rent, the city agreed to continue to pick up the monthly debt service on the commission’s construction loans. In March, the Friends of Little Saigon staged a protest over the decision. The group held several community meetings about the siting, and subsequently met with Murray to air its concerns. Quynh Pham, president of the Friends of Little Saigon community organization, said neighborhood residents have nothing against the homeless. But the decision was reached without hearing the views of the community, she said. “It felt like they assumed this community would be against the project without talking to us first,” she said. Olberding said Murray pledged that city officials would work with community residents to address concerns over public safety and potential impacts to the small businesses that surround the site. Modeled after a similar “low-barrier” shelter in San Francisco, the navigation center will, according to city officials, play a key role in Murray’s strategy to reduce homelessness in Seattle. The facility will feature dormitory-style rooms and on-site services to help clients transition from the streets into permanent housing. Murray has said Seattle’s navigation center could host up to 75 people. Once there, clients will have the freedom to come and go as they please and have their pets, partners and possessions with them.